Report came in that Microsoft used Battlefield 4 gameplay footage that was recorded on PC to promote Xbox One Battlefield Showdown that was held on November 1st, 2013. The game was running on PC in the recorded footage but the footage was watermarked with Xbox One logo. Recent reports make it clear that EA’s biggest first person shooter, Battlefield 4 is running at native 720p on the Xbox One. This resolution is lower than both PC and PlayStation 4 versions of the game, this takes Xbox One step down from its sore rival that is PlayStation 4. Despite of the fact that Xbox One version of Battlefield 4 has the lowest resolution, the game looks very detailed in a gameplay trailer that Microsoft is using to promote “Battlefield 4: Showdown”, a Battlefield 4 tournament between Europe and USA that Microsoft is sponsoring. The trailer can be seen on Official Xbox Youtube channel. Turns out that the gameplay footage is not taken from Xbox One but is recorded on PC and Microsoft is still using it with an Xbox One logo watermarked on it. 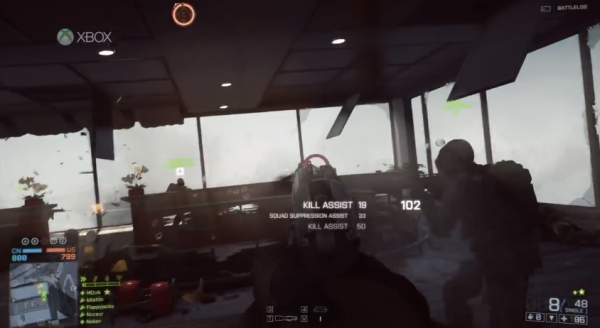 Furiousfanboys first detected “backspace” option during the gameplay that is used to view battlelog. See “Backspace” option at the upper right corner. As the report took heat, Albert Penello, Microsoft’s director of product planning was asked why Microsoft used PC footage of Battlefield 4 for Xbox One promo. This was his reply on Twitter. @ambar_hitman @majornelson …because it was a promo done on Youtube using stock footage a month before official footage was released? Huh? We will be updating the post according to the further information and discussions on the news. Keep visiting this page to get complete information and latest news about the report.